Chinese manufacturers have found a haven in Amazon (FBA) where they can sell (almost) direct-to-customer and they are happy to make a few bucks (literally) on the deal. The [technical] thing about [SMD] LED flashlights is that they emit ± 5nm of their intended wavelength. ONE of the peak absorption spectra of our photoinitiator is 385nm (there are others @ 325 and a small one at 355). The light that you have given as an example is the most common [SMD] LED chip which puts out 395nm. 395s are very common because they work well to fluoresce black scorpions, body fluids (forensics), currency dyes and many of the retail markets’ most common uses. 395nm is just OK with respect to curing resin because with 390nm being in their range, they fall into the 1st standard deviation of the photoinitiator’s desired peak. To summarize, they are OK. Just OK. They will also APPEAR to put out more light and that is because on the other side of their spectrum (400nm) is VISIBLE light. If you judge an LED light by what you can see, you are judging the wrong aspect of their ability. The chip we use is custom made for us in the same outstanding aluminum housing, with (at most times) the same parabolic reflector (sometimes other flashlights of the same appearance will have a stippled reflector to put out a broader beam) but our chip puts out at 385nm and cures our resin very well. Period. The ONE thing that Solarez resins do VERY well is to cure well in the presence of atmospheric oxygen which is an antagonist to curing. Ask any welder how much better an Argon welding unit is because they flood the excited molecules with an inert gas (Argon) so the super-heated iron cannot react with atmospheric oxygen which is terribly reactive (rust, rancid oils, aging skin, etc). Another small but helpful attribute of our light is the pulsing feature. Curing a zillion molecular bonds in 10 seconds liberates quite a bit of heat and heat causes yellowing and shrinkage. 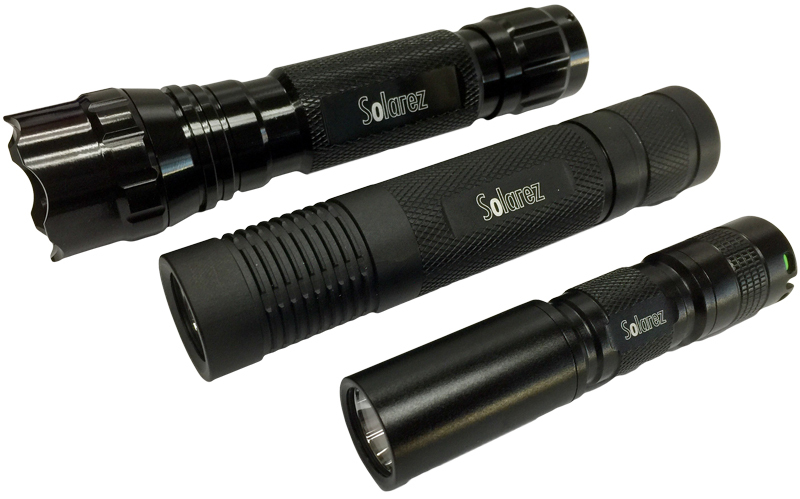 The pulsing feature of our flashlight allows the resin to cure and rest, attenuating the untoward effects of heat build-up. You might also want to check up on the mAh of the battery included and its overall reliability (we’ve had several suppliers on this end of things). You might recall a minor problem SAMSUNG recently had with batteries. So, there is a combined technical, and economic breakdown of why we sell our flashlights at the price we sell them. Keep in mind also the minimum quantities, quality control, overhead (too numerous to list), shipping, and last but not least, return policies. We have a 100% satisfaction guarantee on all of our products.